Most people don’t realize that two of the most popular training tools in the world right now, the TRX and the Total Gym are take offs of traditional gymnastic ring training. 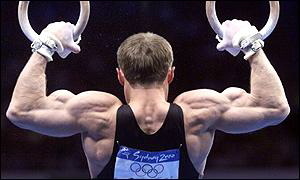 And rings aren’t just good for training gymnastics tricks. You can use a set of rings to exercise every muscle in your body and get a great metabolism boosting workout. This is a great exercise for the triceps muscles on the back of your arms. In this video I have my feet on a Swiss Balance Ball, but a simpler variation is to put your feet on the floor. This exercise will strengthen your back and arms, and do wonders for your posture. 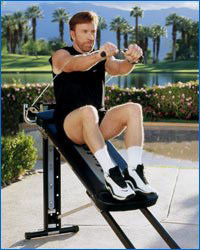 If there was a single exercise I’d recommend for everyone, the body row would be it. Pistol squats are a phenomenal exercise, but they are very difficult. Using the gymnastic rings allows you to train the pistol without losing your balance, plus the rings take some of the load off your working leg, allowing you to build up to a full pistol squat. This is one of the best exercises for training your core. Dips have been called the “squat of upper body training.” If you want a strong chest, strong arms, and shoulder stability, try dips. Scapular depression is one of the most under-trained movements in the gym. It is also one of the most important things you can do to improve your posture and shoulder health. If you’re going to do curls, do them on the rings. You can improve the basic push up by using the rings. It will challenge not only your “push up” muscles, but also your shoulder stability and core strength. For beginning exercisers, you can use the rings to reduce the amount of your body weight that you are pushing, making it less difficult than a push up on the floor. One of my favorite exercises for the back of the shoulders.